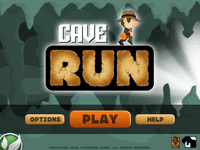 Cave Run is a running game for the iPad, iPhone and iPod touch, similar to Canabalt. Featuring extremely simple gameplay, an Indiana Jones-esque theme, and random levels/obstacles that you must overcome by jumping. How far can you run before falling off a cliff? Do not forget to collect as many coins as you can along the way since they will help the final score! One run is all you need to see how addictive this game is!